“They all want the Germans gone, just like you do. But don’t be thinking that makes you welcome”. 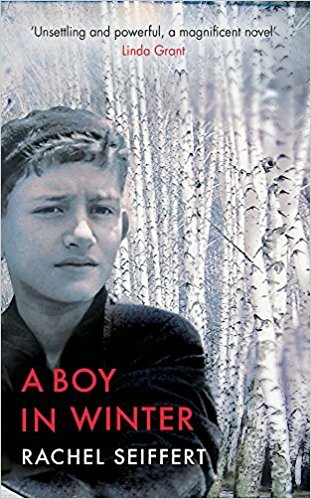 Set in the Ukraine in 1941, one of the darkest periods of that country’s history, Seiffert’s story is told in language which seems, in a remarkable way, to echo the rhythms of the native language of her characters. Darkness pervades her narrative and the actions of her characters. Indeed, most are so traumatised by their experiences that a reader might have considerable difficulty in comprehending their motives. The Russian army has retreated as Hitler’s advancing storm troops sweep through towns, forcing confused Jewish inhabitants from their homes. The troops carry out acts of unspeakable cruelty, but A Boy in Winter is a story of survival and loss on both sides of the conflict. Survival comes at a cost and moral and religious considerations are often set aside, forgotten in the desperation to avoid death. The non-Jewish townsfolk and peasants have no argument with their Jewish neighbours but know that their own survival depends on distancing themselves from them. Seiffert’s description of the events of that night are as detailed as they are dreadful. For me, her images recall some of the scenes of carnage in Jonathon Littell’s The Kindly Ones, somewhat overshadowing the central story of the young Jewish brothers, Jankel and Myko, who appear in the first pages of the book, only to disappear until almost half way through the narrative, when Yasia observes them fleeing from the Germans, terrified. Her instant maternal instinct is to warn them off the streets during curfew and offer them a few hours of respite from their desperation in her uncle’s hayloft. Inevitably, they outstay their welcome, refusing to leave until they are discovered. Yasia’s family turns on her, protecting themselves by forcing her to leave the town to trek vast distances alone to join relatives in the non-occupied settlements of the marshlands. Jankel, angry and suspicious, follows heruninvited, carrying the exhausted Myko on his back as they struggle along endless mud tracks, sleeping in the open. Yasia’s bitter resentment and her hope that they will somehow disappear, do not stop her from caring for the younger boy as best she can and sharing the little food she has. In the lawless marshlands, where gangs demand protection money from villages, Yasia finds a means of acceptance and survival by helping with the work of the farm. But she has lost her family and her hopes, just as she has lost Mykola. Jankel and Myko find protection here, where no one calls them by their names or mentions their religion, although they are about to lose much more. From the moment the priest arrives, and they are baptised in the river with the other village children they will be safe. They will never be Jews again.